Once a month, our county school board opens their warehouse doors for a sale of all the cleaned-out, discarded, "old-school" stuff that they no longer use. Cabinets, tables, big metal teacher desks, weight-lifting equipment, overhead projectors, graffiti'd kid desks, pianos, colorful chairs, and….if you dig deep enough, games! I purchased these last fall, because they were pretty much irresistible. 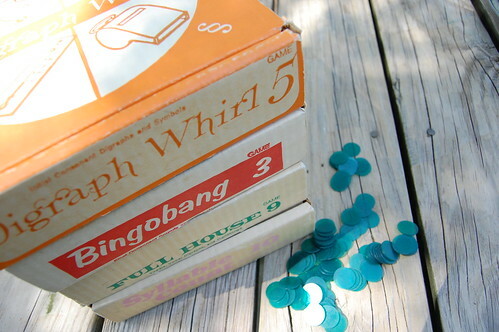 A game of digraph whirl, anyone?? The suggestions for our summer game collection have been rolling in. I love all the varieties, and I love that so many of the same ones keep being mentioned. I figure that's a pretty good sign. So I decided a master list was necessary. I was going to just list them all here in the post, but I figured it might be nice to have something in-hand, to tuck in my bag that I can whip out when I'm shopping, or thrifting, etc. So this morning I dumped the master list into a pdf. Click on the image below to download a copy for yourself! And thank you, thank you!! for all the great suggestions! Oh, but if no one mentioned ‘Settlers of Catan’, you’re missing out! Please, please find this game! Perfect for older kids (say, 8+)and younger ones in teams with adults. It’s like Monopoly without money, but with natural resources. Slightly longer games, but everyone is involved in all the turns, so no real waiting. So wonderful! oh and it’s printable!! you are a rock star-thank you! 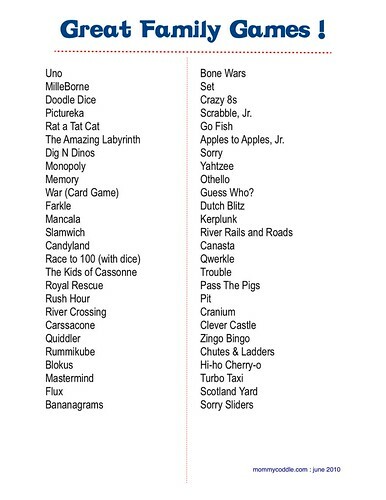 Thanks for the printable game list. I’m always on the lookout for new games for our family. Thanks, Molly.Have a great weekend! Brilliant! Thanks for the printable! I was just checking Target the other day for the ones you mentioned in the original post! I’ll have to have a look for some these. i bought bananagrams the other day- brilliant for older kids. We find it really addictive. molly, can you PLEASE PLEASE PLEASE tell me when these are??? Awesome! We’ve been hosting a weekly games night this summer with some friends and I see many of our favorites on there (Carcassone, Fluxx, Bannanagrams). We also just purchased Blink after reading your post and my husband and I have had some heated matches this weekend!